Help – My Puppy is a Land Shark! Since puppies are born without hands, the only way they have to explore the world is with their mouths. And you may have noticed that your puppy is quite the explorer. Everything goes into those little mouths, including your fingers, and those baby teeth are like little needles. Ouch! It’s completely normal for puppies in their litters to bite each other in play. When they engage in this “bitey-face” game, they learn a little about how to inhibit the strength of their biting. If one puppy bites another too hard, that puppy probably will yelp and stop playing. If that happens enough times, the biter learns to apply less pressure. But puppies are covered with fur and we’re not. The same level of bite pressure that is appropriate during puppy play can hurt us and even break the skin. The inhibition they learn in the litter helps, but it’s usually not enough to teach young puppies how to properly interact with humans. How Do You Stop the Nipping? Some trainers will recommend that you hold your puppy’s mouth closed, yell “No,” or even push their cheeks into their teeth so that they hurt themselves. If you look at it from your puppy’s point of view, this may teach them not to nip, but it also teaches them not to trust you. They’re not being malicious when they nip you, they are simply doing what they are instinctively programmed to do. There are much better ways to deal with it that don’t involve hurting your puppy and making her fearful of your hands coming near her face. puppy’s reach. When your pup is calm, you can slowly offer one hand to her mouth. At this point many puppies will lick the hand. This, or any behavior that is NOT biting, should be rewarded with continued attention and/or a food treat. But if you get another nip, redirect to a toy. Your puppy will soon learn the rules of the game. This lets them know gently that mouthy and nippy behavior doesn’t get any attention, it simply makes me stop interacting or makes me go away. Redirect Redirect and More Redirect! Having a puppy at home requires a certain amount of preparation. A key part of this preparation is having on hand, in lots of locations, appropriate toys, and chews that can be used to redirect nipping behavior. You need to be set up so as soon as, and whenever your puppy begins to nip you can immediately interceded with a toy. Use the toy to redirect your puppy from you to the toy. Encourage your puppy to grab the toy, play with the toy and bite the toy. This can become a fun game for you and your puppy. It not only teaches them that interacting with you is fun but it will also deter them from nipping at you. Here are a few examples of when having toys around is important so you can quickly intercept nipping and redirect it to a toy. Enjoying puppy nap time – A relaxing nap on your knee and cuddle session can quickly turn into a puppy hand-bite-fest!. Always have a toy on hand to redirect any attempt to engage you with puppy nipping. Your puppy is not going to learn in one session that nipping is not appropriate and not appreciated. They simply do not learn this right away. She is biting because it is something she was programmed to do. At birth it’s as unconscious a behavior to her as breathing. She has to learn first to connect to it as a voluntary behavior that she can control. That’s why the initial pull-away after you stop interacting is often followed by another nip (if your hands are within nipping distance). 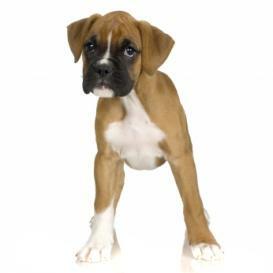 It will take a lot of consistent repetition before your puppy is able to get to the stage where she lunges to nip but inhibits herself before making contact. If you and other family members keep a simple record of this nipping behavior you will see in time that it reduces in intensity and frequency. One day you will stop, think and realize that the nipping has ceased. It’s hard for young children not to squeal, dance, wave their hands around and run when puppy is nipping at them. This, of course, delights the puppy and encourages her to continue her “playing.” In this case, or if your puppy is persistent and continues to nip at your ankles when you walk away from her, let her drag a leash in the house (when supervised). After a nipping incident, you can tether the leash to a doorknob and walk out of her reach or move your children out of her reach. When she has calmed down, slowly and calmly approach and offer a hand for a lick. Licks (or non-biting behavior) get praise and continued attention. Nips make the people go away again. Make sure to supervise children so that they don’t turn this into a rousing “tag” game, winding the puppy up and frustrating her! Movements away from her must be immediate and smooth, and movements towards her must be calm and purposeful. The most important thing you can do when your puppy is a little land-shark is to make sure that nobody in her world is rough-housing or wrestling with her with their hands. If this is happening, then no matter what else, you are confusing her with a game that in essence tells her, “Go for my hands!” Most puppies love to rough-house, and you can still do it. Just substitute a toy for your hands. While she’s going after the toy if clumsy puppy misses and nips your skin or clothing, you can yelp (if that works for your puppy), drop the toy and stop playing. That will also help teach her to be more careful with her mouthing. If you do absolutely nothing, chances are your puppy will outgrow this stage on her own. But if you are consistent, persistent and patient, reinforcing calm behavior and withdrawing attention for mouthy behavior, you may survive your dog’s puppyhood with less tooth marks! Remember always actively supervise children around your puppy. Keep it fun, safe and educational for both kids and puppies! 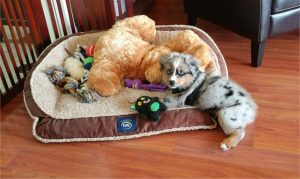 This entry was posted in Your New Puppy on August 7, 2018 by Niki Tudge. All content copyright The Dogsmith. All rights reserved.